A combination of nanomaterials that can mimic nerve impulses (“spikes”) in the brain have been discovered by researchers at Kyushu Institute of Technology and Osaka University in Japan. Current “neuromorphic” (brain-like) chips (such as IBM’s neurosynaptic TrueNorth) and circuits (such as those based on the NVIDIA GPGPU, or general purpose graphical processing unit) are devices based on complex circuits that emulate only one part of the brain’s mechanisms: the learning ability of synapses (which connect neurons together). The researchers have now developed a way to simulate a large-scale spiking neural network. They created a complex SWNT/POM molecular neuromorphic device consisting of a dense and complex network of spiking molecules. 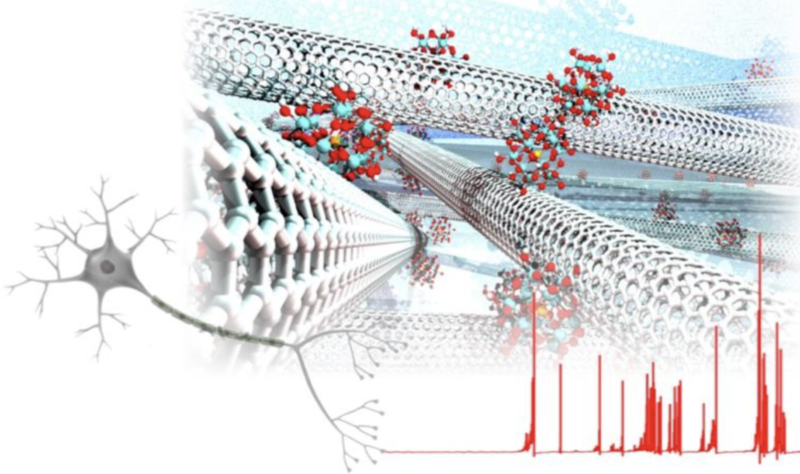 The new nanomaterial comprises polyoxometalate (POM) molecules that are absorbed by single-wall carbon nanotubes (SWNTs). Unlike ordinary organic molecules, POM consists of metal atoms and oxygen atoms that form a three-dimensional framework that can store charges in a single molecule. The new nanomaterial emits spikes and can transmit them via synapses to and from other neurons. The researchers also demonstrated that this molecular model could be used as a component of reservoir computing devices, which are anticipated as next-generation neural network devices.